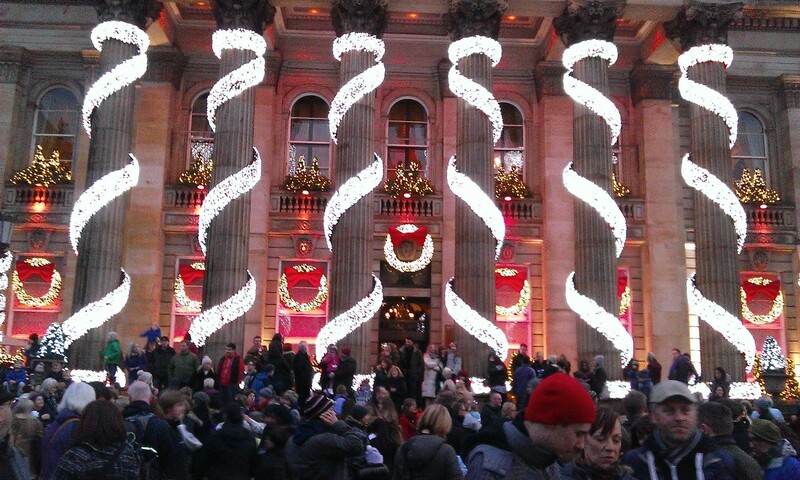 On Sunday afternoon, along with 26,000 other people, we walked along George Street and saw Edinburgh’s Christmas lights being turned on by Chris Hoy as part of Light Night. There were many entertainers, performing on several stages. I thought that Forth One DJ Arlene Stuart did a great job of introducing the event. Librarians! How you can empower all your researchers to find, and be alerted to, the very latest scholarly papers – and get the credit for it. If you’re a librarian in a research or academic library, then you know how important it is for your researchers to find, and be alerted to, the very latest articles being published on topics of interest to them. The most recent papers can often be the most vital. So, do you expect your researchers to do it all themselves? Or maybe your library or resource centre is considering subscribing to a scholarly article current awareness service? Of course, there are various free current awareness services available, and I’ve written about many of them here*. And JournalTOCs happens to be the biggest, free service of them all, with the very latest articles from over 23,000 scholarly journals from ALL the big publishers and many of the smaller ones (over 2,000 different publishers in total). and possibly just as important – a service which in addition to everything else allows you to create alerts and do the personalisation for those researchers you know won’t want to do it themselves. All of this is possible, and at a price that your library can afford. The service in question is the institutional version of JournalTOCs – called JournalTOCs Premium. I could try to describe it here, in writing, but it would take me forever to explain all of its really good features. So, instead, I’ve put together a short video. The video gives you a backroom picture of how you, the librarian, can empower your researchers to find, and be alerted to, the very latest scholarly papers being published, as soon as they become available online, with links through to the full-text of everything (Open Access and your subscribed content) that’s available, via the Web and via email. It also shows how you set things up yourself for those researchers who don’t want, or who don’t have the time, to do it themselves. The busiest researchers are often the best potential researchers, but they’ll miss things without your help. A free trial of JournalTOCs Premium is available. * That post, Where to find new scholarly research papers: 30 key, free websites gets thousands of hits, even though it was written some time ago. Why? Because so many people are looking for help in finding new scholarly papers, and they need your help. I’ve added the following titles to JournalTOCs, the free current awareness and alerting service for researchers, students and lecturers. JournalTOCs now contains details of the latest Tables of Contents of over 23,100 scholarly journals, including more than 6,800 Open Access journals, and is the largest freely available collection of scholarly journal Tables of Contents. There is also an institutional version of JournalTOCs – JournalTOCs Premium. I’ve learnt quite a lot from reading The Sugar Barons, by Matthew Parker, and I previously didn’t realise how interesting is the history of the West Indies. 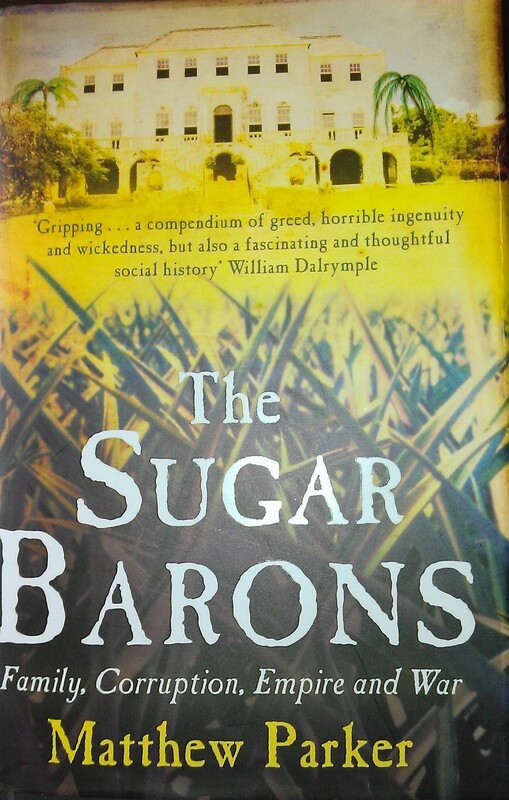 I read another book about Sugar in Barbados some time ago, and therefore knew something about the history of that island, and Parker’s book covers some of the same material, but it also deals with sugar production and its history in other islands, especially Jamaica and Antigua, and places the history of the sugar barons in a wider context. I had not realised how deadly the islands in the West Indies were in the early centuries of their development – in Kingston, as many as 20% of the town’s population died every year during the first decades of the eighteenth century, mostly from malaria and yellow fever. Sometimes the death rate for Europeans was higher than for slaves, despite the poor diet and living conditions of the latter. It was a cruel existence for all concerned, and lead to much drinking and unsavoury conduct. Treatment of slaves was extremely harsh in Jamaica, Barbados and the other islands and worse than on the American mainland. This was because the plantation owners and managers were more outnumbered on the islands by slaves. Many believed that the only way to keep order and stop revolts was by using dreadful methods of control. A lot of the plantation owners became absentee owners. Those who survived often made large fortunes, and sometimes spent them back in the UK, on building enormous houses and buying their way into Parliament. There, they were known as West Indian nabobs. Parker doesn’t say so, but I believe that some reformers in Parliament wanted to extend the franchise so that such nouveau riche could no longer purchase seats. Many of the plantation overseers were Scottish (probably because their relatively better education in Scotland made them seek opportunities not available in their homeland, and also because of changes to Scottish society in the 18th century). Sometimes, due to the free availability of rum, they were responsible for the worst attrocities against their slaves. I had not realised that, towards the late 18th century, the Caribbean colonies were seen in North America as extensions of the mainland colonies, and many there expected the islands to join with them in revolt against the Crown. Although the West Indian assemblies had a long tradition of defying imperial control from London, that they didn’t join the North Americans was partially because the English in the West Indies never had the attachment to the place that those in North America developed. For many in the West Indies, ‘home’ remained Britain. They were also much more dependant on trade with London, Bristol, Liverpool and Glasgow than the North Americans. There was much more fighting between the islands than I had realised. French, British and Spanish colonies changed hands fairly regularly. At the end of the Seven Years War, at the Treaty of Paris, the French were given the choice of retaining Guadeloupe or ceding large parts of Canada. They did not hesitate to choose Guadeloupe and hand over Canada. In London, people thought that the government had sold out to the French! What happened only makes sense when you realise how valuable the islands were in those days – in 1773, exports from Grenada alone were worth eight times those from Canada. Not diving into the open grave with Fat Mac the other day was worth celebrating, which I did in much calmer circumstances, with No Longer Grim Jim and the Tall Thin One, tonight, in two bars up town. The following is in reverse order. You might need to concentrate in order to get the full jist. OMG. How did it get so late? The taxi driver who gave me a lift home was from Iraq. From an unpronounceable town somewhere close to Basra. Despite that fact, he had not ever heard of Wilfred Thesiger … (Marsh Arabs), (I checked twice), so we kept the discussion to non-literary topics. Was the taxi driver Sunni or Shia? Well, he was definitely one or the other because I asked, and he told me, and I can’t honestly remember which one he was, and we didn’t discuss the merits of either, thank goodness, otherwise I wouldn’t have got a word in edgewise. We ran through three thousand years of Middle East history in about thirty seconds (mostly me, actually), and got straight up-to-date with the fact that there are still suicide bombers doing their thing in Basra, recently. I didn’t know that. I thought it was mostly happening up in Baghdad. The bearded President that they hung – thon Saddan Hussein chap – at least he kept order. There were far less suicide bombers in those days (mostly the taxi driver). The Kurds – they are a people without a country. We agreed that the Kurds should get their own space. He thought that the Shah of Iran was essentially quite a good guy at heart, which threw me off completely, because I thought we were talking about Iraq. Now I come to think of it, I may have misunderstood, due to the traffic noise, whether he came from Iraq or Iran (easy error). But it was definitely somewhere near Basra. The taxis for hire are all going up-town. Why, Oh why, can there be six free taxis going in the opposite direction, and bugger all taxis going in my direction? Well, that was an excellent night with No Longer Grim and the Tall Thin One. Thank goodness No Longer Grim didn’t buy another pint. We’re safe! No open grave tonight. OMG – It’s cold out tonight. Does her husband have a lot of hair? So – all three of us had different complexes in our formative years. Jimmy thought he was too short, Leslie thought he was too tall, and Roddy thought his hair started to fall out when he was too young. So these academics have done a study of why people like different sports. Some people like watching a sport where they KNOW who is going to win – like with Usain Bolt. Some people like watching a game where the outcome could go either way. Some people like the anxiety of watching England play cricket. Golf is the only sport where there’s no contact whatsoever with the opponent. Golf is therefore completely in the mind – even more so than cricket. So, that’s the final innings for the Little Master! Why there will not be an independent Scotland in our lifetimes. That’s better. This place is a lot quieter. What? WHAT? This place is heaving. I can’t hear a word you’re saying. 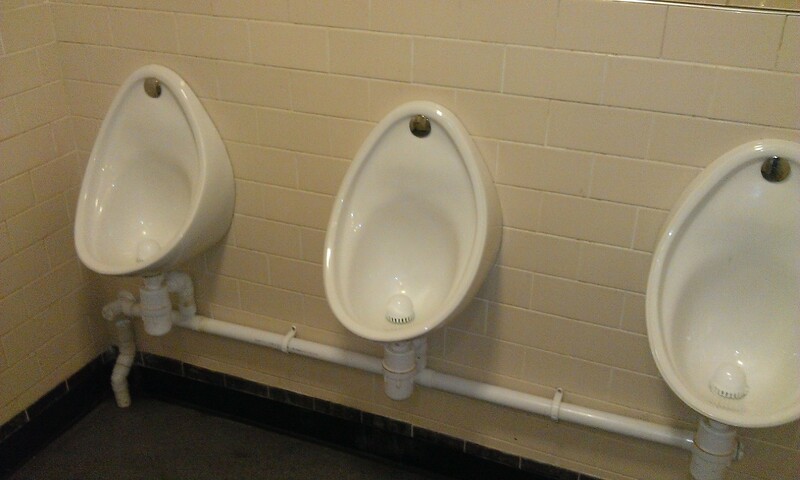 Let’s go to another bar after this pint. Hi Jimmy! Hi Les. Fit like? Yes, a pint of lager please, since you’re asking. Thanks for the lift, my loveliness. See you later. Fat Mac, who used to be a librarian (of sorts), had shown some interest in cycling to Pinkie, but in the event he had to go out drinking beer with some widows that day. Today, he emailed me and asked me where to buy padded breeks – he wanted to get a pair for his elder brother, who doesn’t get out of his house very often – so I told him the name of a good shop with a selection of outdoor clothes, and sent him the website address. “Ah cannae work they online purchasing shops” came the reply. So I pointed out that the shop also had physical shops, and a ‘Store finder’ facility on their website. 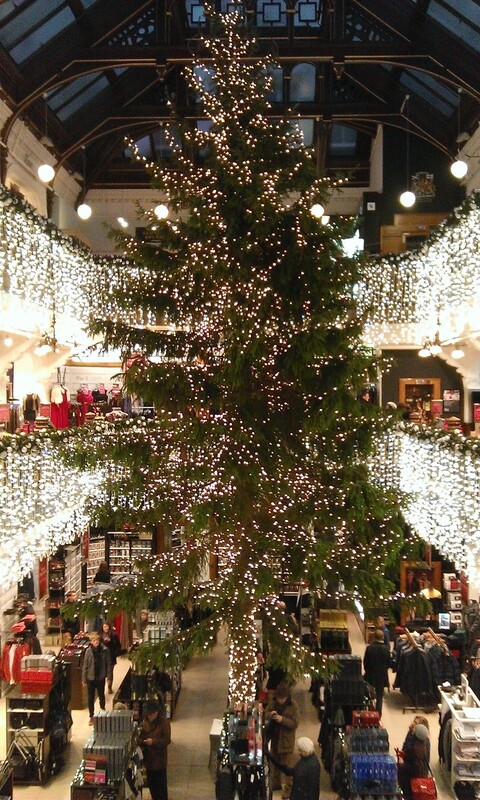 “Ah cannae work they finding where the shop is things” came the reply. So I started to describe where the nearest shop was, and how he could cycle down to it, but then I realised that he’d only get lost, either there, or on the way back. I know that for a fact because every bike ride that Fat Mac has organised has started out with the intention of him showing me how to cycle to Balerno along cycle tracks, but not once have we ever got there, and mostly we’ve ended up in a pub that sells cheap beer down in Crammond (miles away from Balerno). So, I thought, this is a bit like missionary work, isn’t it, and I said I’d pick him up at his flat in the campervan and drive him to the shop in question, for which I happen to have a discount card, so he’d get good value. 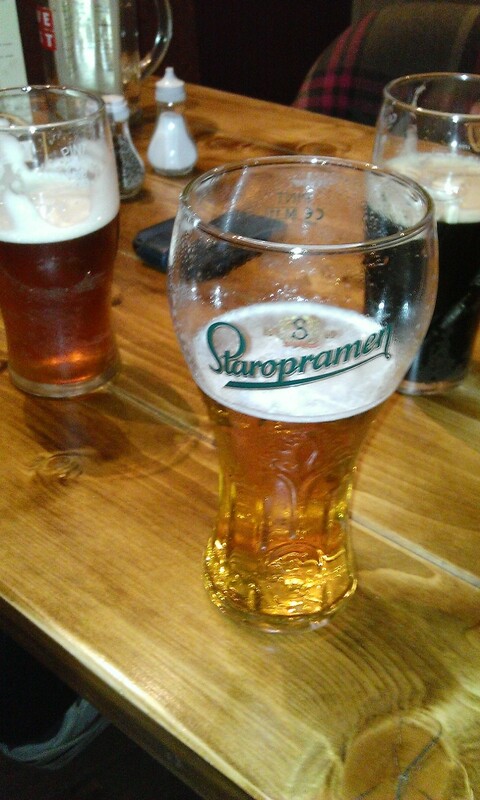 Having the campervan would also ensure that we’d not end up in a pub, as well. Eventually, we got them sorted out, a left and a right, paid, and left (the shop). “We’ll need to find somewhere that sells coffee, and not beer.” I answered. So I drove to a Turkish cafe in Leith, where we enjoyed two coffees. We’d finished our coffees when Fat Mac started to slaver a bit. I looked around and suddenly realised that behind the counter were some beer bottles. The cafe had a drinks license! And Fat Mac had noticed. And for once, we did – we left the open grave behind. In 1945 (as Neil correctly pointed out last night in a Comment) many of the British and Allied forces were busy fighting the Germans on the Continent. Two hundred years before that, as I wrote in my previous post, part of the English army was busy in Flanders fighting the French whilst the rest were being beaten by the Jacobites at Prestonpans. Almost (but not quite) two hundred years before that, in 1547, some of them were at it again, at the Battle of Pinkie. This time, the English inflicted a major defeat on the Scots. 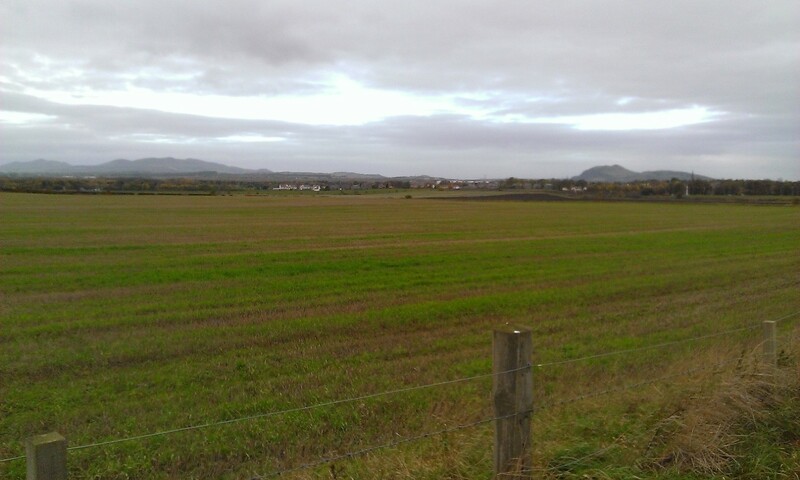 The battle sites of Prestonpans and Pinkie are not far away from each other. 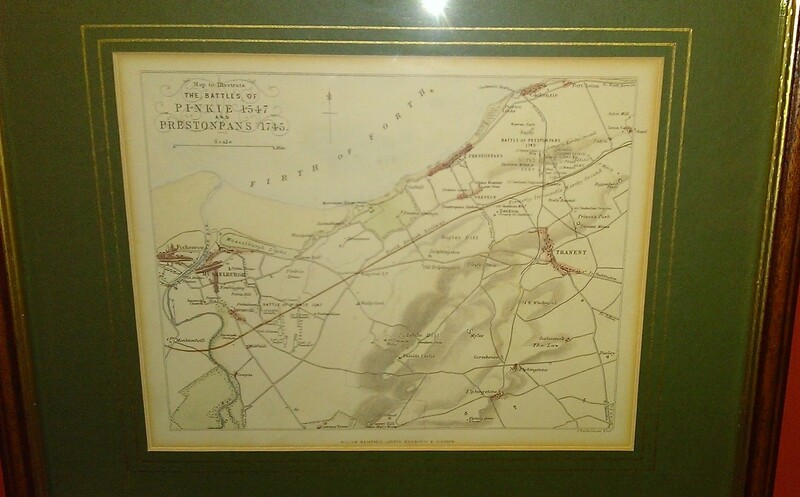 In fact, in my living room I have a map showing how the forces were lined up against each other at both battles. 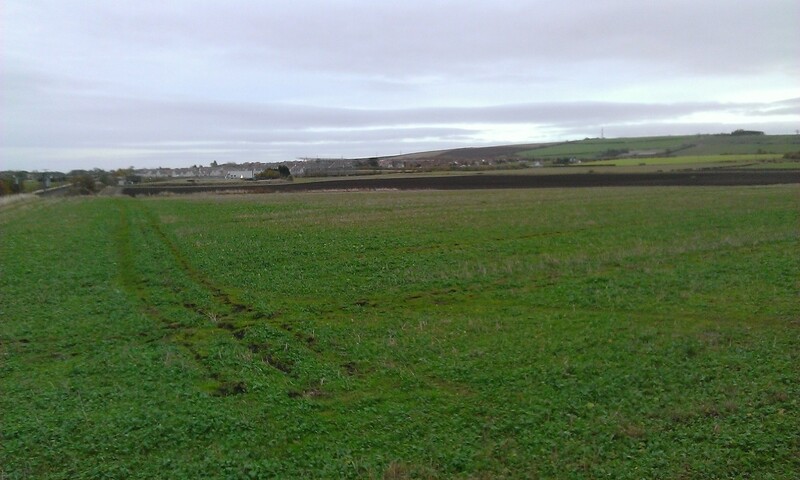 So enjoyable was yesterday’s bike ride to Prestonpans, that I cycled over some of the same route today, but this time concentrated on sites associated with the Pinkie battle. The weather wasn’t so nice, but it was a good run. 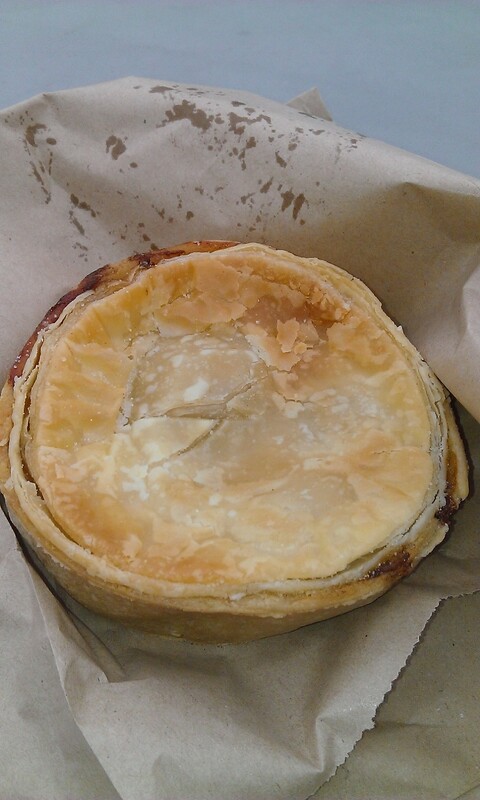 I started with a steak pie for breakfast at the Breadline Bakery. 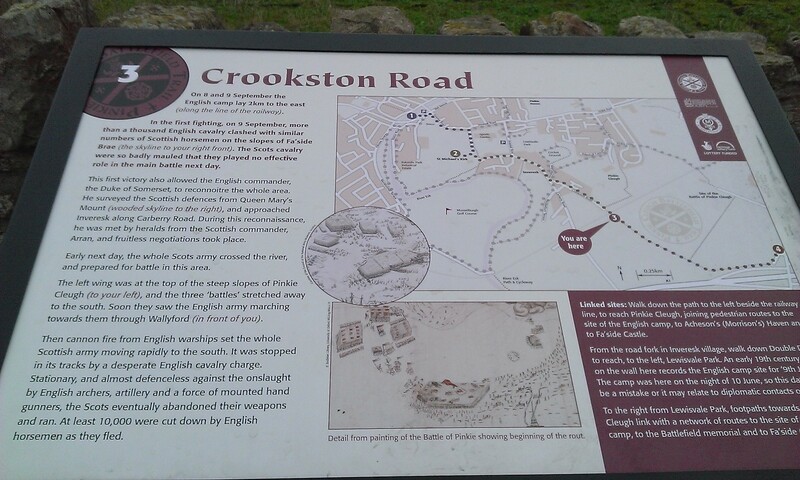 The Pinkie Cleugh Battlefield Group have written an excellent guide to a walk of the battle sites. 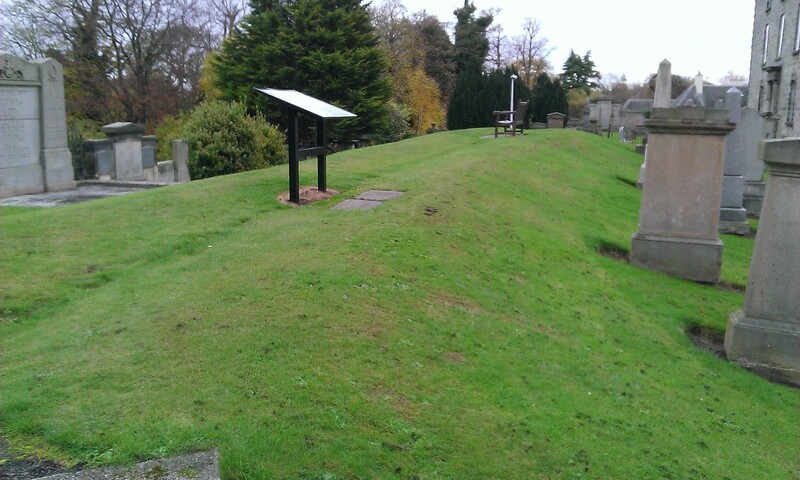 I wanted to see Somerset’s Mound, also known as Oliver’s Mount, at Inveresk Church. It was a defensive position, used during the battle. The area around the church is ancient. It was used by the Votadini, and the Romans had a fort there. They’re building a lot of new houses between Wallyford and Pinkie village. Soon, the two will be joined up. In the summer of 1958 I used to help Wullie the milkman deliver milk round Pinkie village. He had a horse and cart, and I’d run up the stairs in the closes and collect the empties and plastic Co-op money. Sometimes, he gave me a wee bottle of orange juice for helping him. A couple of times he gave me a thruppenny bit. Once, he pulled out a hair from the horse’s tail, and gave it to me. PS – I may have to cycle to Crécy (battle, 1346) for the next blog post, and for the one after that, Faringdon (battle, 1145).